Electrically coupled cones : This patented device (US Patent 3,048,046) is composed of thin lami­nates of paramagnetic material. The laminates are separated with semidielectric materials which also localize the effect of the inductive field. 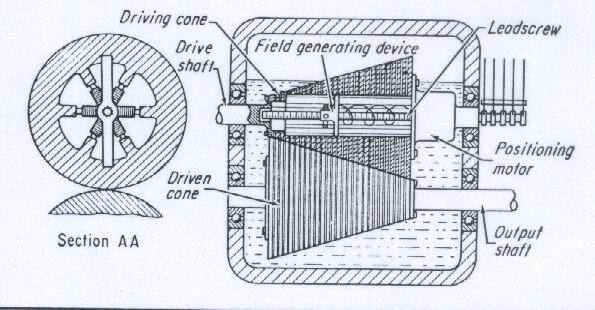 There is a field generating device within the driv­ing cone. Adjacent to the cone is a posi­tioning motor for the field generating device. The field created in a particular section of the driving cone induces a magnetic effect in the surrounding lami­nation. This causes the laminate and its opposing lamination to couple and rotate with the drive shaft. The ratio of diameters of the cones, at the point selected by positioning the field generat­ing component, determines the speed ratio.